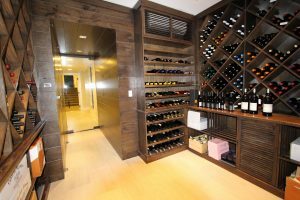 Amagansett, NY 8/13 – Stained and Lacquered White Oak Diamond Bin upper racking and Slat Bin case storage with a 1.5lt racking from Genuwine Cellars. 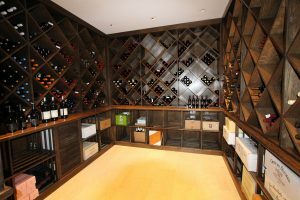 This wine cellar uses the Wine Smart computerized cooling system with an integrated humidity controller. This wine cellar holds 1,500 bottles.